Marketers are diving more and more into the social media world in Lebanon... But are they doing it right? Sayfco Holding reached more than 50,000 fans by granting anyone who likes their Sayfco Holding Facebook page the automatic entry to a sweep stake that would allow him to "WIN a $1m apartment"; and other similar offers "The fan with the most friends on Sayfco Holding page before 28th Feb 2011 will WIN $10000". 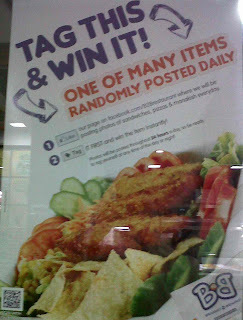 B2B launched a "Be the first to tag an item's picture and win it". For that of course, you will need to like the B2B Facebook page. A cost-effective intiative, I may say. They also used a QR code on their posters to link to the page. Sony World is offering you a chance to win a Sony Vaio C laptop on the Sony World Lebanon Facebook Page, granted, you need to like their page, to be able to upload a picture "where you feel like you shine" (to match their current advertising campaign) and get the highest amount of likes on it; i.e. get your friends to like their page too. Citi Furniture has created an "ugliest couch contest" on the Citi Furniture Facebook page , a creative initiative, not the first of its kind globally, but cute nonetheless. That, just to name a few Facebook competitions taking place in Lebanon. ...And finally here's what Facebook would have to say about all those campaigns; here's a summary exerpt from Facebook Promotions Guidelines : "You must not use Facebook features or functionality, such as the Like button, as a voting mechanism for a promotion." But we all know Lebanese never read guidelines or any other sort of user manuals for that matter! Were you really expecting anything different? The above is not allowed because Facebook doesn't want to take responsibility of the accuracy of its LIKE button. (But this is allowed if you do a custom application for that). Yes i agree with Riad, if you build a custom application for the competition then it is allowed. But as far as I know Sayfco and B2b do not have a an app, I did not check the others yet. I just found this kind of satisfactory readings i was looking for.I had bookmarked this website to avoid missing it again.